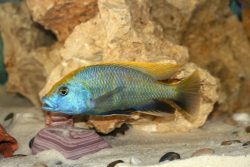 You could be completely new to the hobby of keeping fish as a pet or you could be a veteran fishkeeper or aquarist who wants to move on to larger tanks. A 45 gallon fish tank is a good place to start, no matter which of those identities you fall into. They’re a nice moderate size between small, desk top fish tanks and larger, showpiece tanks. Though it’s a moderate size, 45 gallon fish tanks are still pretty big compared to many dorm room and office sized fish tanks out there. But, a 45 gallon aquarium is going to work nicely as a table top tank, or a free standing tank in a living room, lobby, or office. In a lot of ways, you can make it part of the overall décor, if you desire, or it can be a conversation piece, off to the side. You’ve got both options available depending on the tank you’re going for. The important part, however, is what you need to remember before buying because it’s not just about capacity size and stopping there. This fish tank is going to be home for an entire community of fish. They’re going to want it to be just as happy and healthy as you want your home. So you’re going to want to make sure the tank you’re using is compatible with your fish, whether they be saltwater fish or freshwater fish (either marine fish or tropical fish). 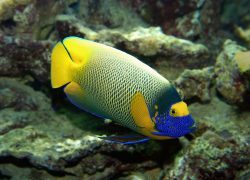 You’ll also want to keep an eye on the filter specs as a filter too powerful or too weak could spell disaster to for a fish. 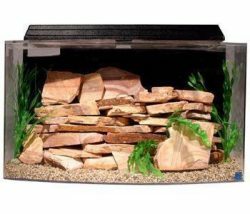 Below are four options for a 45 gallon fish tank, and a few 46 gallon fish tank options as well, to help you make your decision easier. 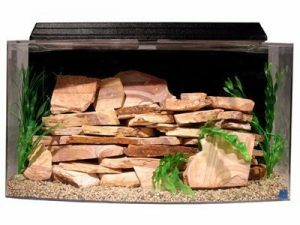 This 46 gallon fish tank is both traditional and not so traditional in subtle ways. It’s your typical tabletop, rectangular fish tank. However, it has a designed bow in the front of the glass to enhance the view of the fish inside. The glass is also strong acrylic, which is nearly 20 times stronger than regular glass. It works for freshwater fish and saltwater fish and cleverly disguises the filter mechanisms with a soothing blue back wall. This 46 gallon aquarium measures 36 inches by 16.5 inches by 20 inches and weighs a light 20 pounds. This makes it pretty easy to move around for an office or even a larger dorm room. This acrylic glass make is impact resistant so that also makes it a great choice for kids and high traffic areas. Thanks to the acrylic it also weighs half of what it would were it glass. The only real drawback is the lack of included accessories and no bells and whistles on this one. You may just want a regular fish tank, in which case, this one is perfect for you. But if you wanted something that came with some of its own features, this is something of a beginner tank. As first glance, this 46 gallon aquarium may be giving you déjà vu to a previous tank on this list. However, this is the System II of the Bowfront SeaClear design and has a few upgrades on the first. So if you liked the first one but it just didn’t include enough for you, this is a tank you’ll want to look into. This is a tabletop fish tank that measures 36 inches by 16.2 inches by 20 inches and weighs a light 20 pounds. It includes a wet/dry biological filtration system, which includes chambers for biological, mechanical, and chemical filter media and space for a heater, though it’s not included. You can find an appropriate heater in our fish tank heater buyers guide. There’s a full hood with a 24 inch light fixture, however the bulb is not included. It’s constructed from strong acrylic glass and includes a quick change pre-filter for easy cleaning. The drawback here is going to be all the things not included. It’s not just accessories, there is space for both heater and light though neither is included so you’ll have to go out and get those yourself, unfortunately. This 45 gallon fish tank is very nice to look at, mimicking the design of a small entertainment center to bring you a freestanding rectangular tank with a full front and side view of the fish inside. It’s the type of tank meant to be shown off as its own decorative piece and you’ll want to keep that in mind when it comes to placing it and where in your home or office you imagine this tank living. The 45 gallon fish tank dimensions measure 13 inches by 36 inches by 24 inches for the tank alone and the 45 gallon aquarium dimensions with stand measure 14 inches by 37 inches by 25 inches. It’s constructed of glass that has a one-piece center braced frame to prevent bowing. 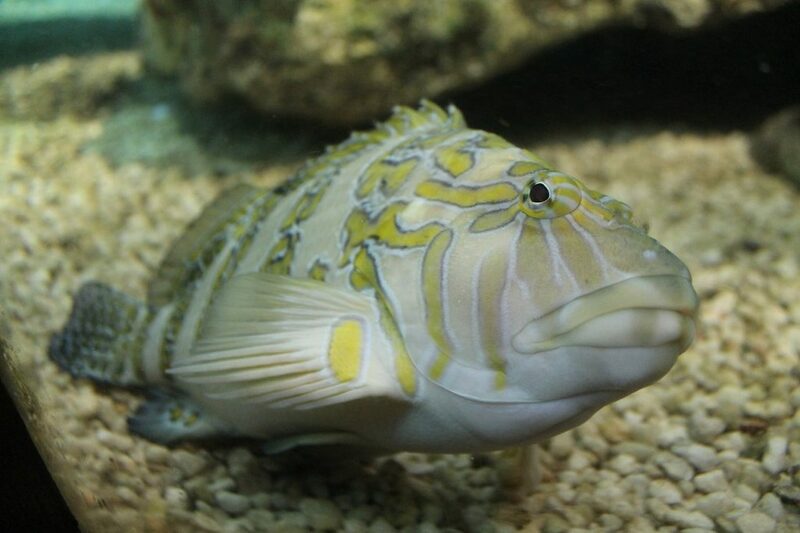 While it does work well for freshwater fish, it’s more ideal for saltwater fish as well as marine fish. It does not include any extra accessories beyond this. There’s a couple drawbacks with this one. For one, it doesn’t include any extra accessories so you’ll need to be running to the pet store for compatible parts. It also, as you may have noticed, comes in two parts, which means there is some assembly required. However, if you’re up for it, it can be a great décor piece for you and a great home for your fish. This 46 gallon fish tank has a nice brand on it and, just looking at it, it’s already a great choice for someone who wants a free standing tank that can act as a nice décor piece, should you want it. It includes an LED light, glass canopy, and a convex design to allow for the best views of the fish. 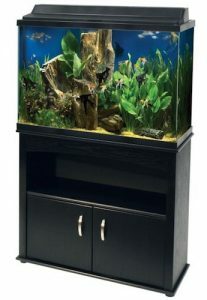 This tank measures 16 inches by 36 inches by 20 inches while the stand measures 16.7 inches by 36.8 inches by 29.25 inches and is intended for freshwater fish, but works for saltwater as well. The stand is included and requires assembly but detailed assembly instructions as well as start up instructions are included with the kit to ensure it works perfectly. It’s a great décor piece for a common living area or lobby. This is another 46 gallon aquarium that requires assembly, but if you’re up for it, it’s a great buy. It also doesn’t include any additional accessories so you’ll need to do some more research and some running around to get those. But once it’s all-together, it’s going to be a great buy. 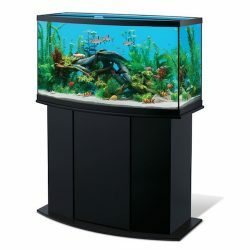 This is a great place to start to get a taste of what 45 gallon fish tanks, and 46 gallon fish tanks have to offer you. There are traditional tabletop designs, some of those 45 gallon fish tank for sale with modern flare, and there are free standing décor tanks as well. While some of these 45 gallon aquarium for sale work great for beginners, none of them include additional accessories so do your research on what you’ll need before you purchase a tank. 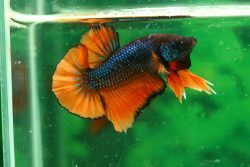 We hope this list of the best 45 gallon fish tanks helps you make a decision on which tank is going to be best for you and best for your fish. So do research and have fun! Thanks for reading and let us know what you think or if you have any questions, in the comment section below.